What's a James Bond film without a breathless and elaborate opening sequence? It's a tragic waste of the 007 code name, is what it is. Fortunately, Spectre doesn't have that problem. Daniel Craig's fourth go at slipping into Bond's Aston Martin commences with a huge set piece: a mid-air fight scene on a helicopter flying over Mexico City's Day Of The Dead festival (Día de Muertos). In true Bond fashion, the production cut no corners in composing an incredibly colorful and intricate celebration to serve as the scene's backdrop. But since a James Bond movie is about as far from a documentary as a movie can be, just how many artistic liberties did this film take to add scope and visual interest to the scene? What actually happens Day Of The Dead, and does Spectre stay true to the events? The official Spectre account shared the making-of video below to give audiences a taste of what they'll see first when the movie opens in theaters on Nov 6. Aside from the carefully orchestrated tussling between Craig and the villains, you can see that the sequence will include a full-scale parade with altars, floats, and costumed extras. I was curious to know if this is what a Day Of The Dead celebration in Mexico City really looks like, so I did some research on the traditions involved. The festival can take many forms and means different things to different people, but there are some constants. Watch the making-of video below, and then read on to find out how accurate Spectre is in its depiction of Mexico City's Day Of The Dead Festival. 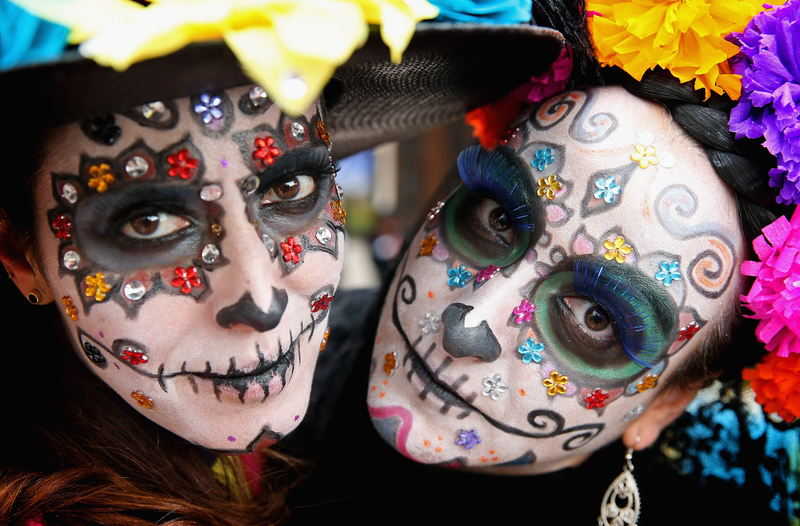 Here's what you need to know about the Day Of The Dead celebration in Mexico City. The Day Of The Dead is actually a two-day long remembrance, from Nov 1 to Nov 2. Part of the tradition involves families holding all-night vigils for their loved ones who've died, so the event runs from day-time celebrations to late-night reflection, and then into the next. Spectre sets its action during a parade, so audiences won't see the personalized altars (or ofrendas) that are decorated with marigolds and placed in homes or on graves to honor the departed or hear the songs and prayers that happen over them. If you were to YouTube search a "Day Of The Dead makeup tutorial," you'd likely pull up step-by-step instructions on how to create a La Catrina look. La Catrina is the 19th century creation of printmaker Jose Guadalupe Posada who produced several pieces featuring a posh, money-ed skeleton lady. La Catrina is now a folk figure in the culture. San Francisco's Mexican Museum curator David de la Torre told the San Francisco Gate why he believes the tradition endures. Catrina has come to symbolize not only El Día de los Muertos and the Mexican willingness to laugh at death itself, but originally catrina was an elegant or well-dressed woman, so it refers to rich people...Death brings this neutralizing force; everyone is equal in the end. Sometimes people have to be reminded. In the featurette above, Spectre costume designer Jany Temine says that the production incorporated authentic Mexican elements into the styling for the over 1500 extras who people the scene, many of them modeled after La Catrina. Mexico City has earned the nickname the City Of The Dead for the magnitude of its annual Day Of The Dead processional. The annual parade may not have a James Bond action sequence happening overhead every year, but it's still a community-wide festival that also beckons countless international visitors. Spectre may have added some extra glitz and glamour to the festival, but overall, it's an accurate depiction of Mexico City's Day Of The Dead celebration and its customs.